The latest addition to my growing Death Guard Legion was a converted Nurgle Helbrute, so Dark Vengeance meets Dark Imperium! This one was a lot of fun to tackle, but not without it's challenges. 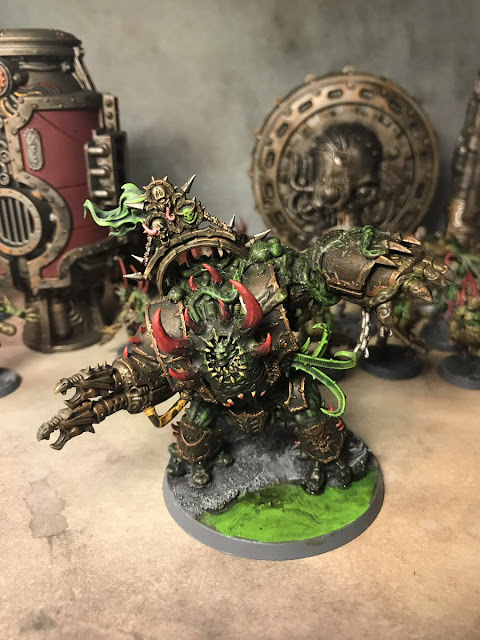 I wanted to go beyond the original model, and make it feel more 'Nurgle', so I set about doing some additions with pieces from other Nurgle and Chaos kits, and some liberal amounts of green stuff and modelling materials. 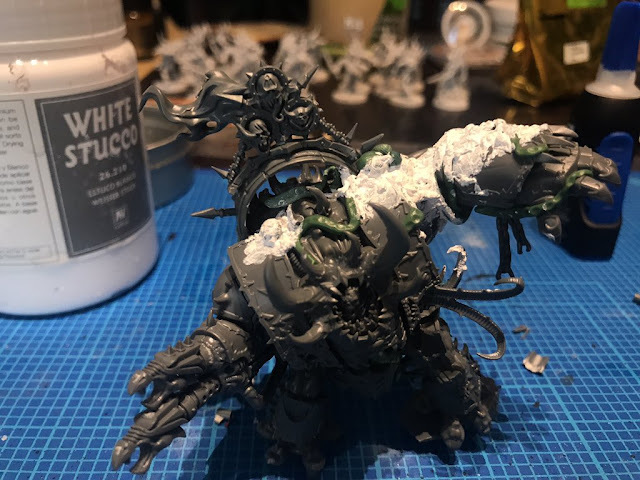 The white stuff is just basic art stucco that I use to create a worn and 'rough' texture around the now diseased part of the model. 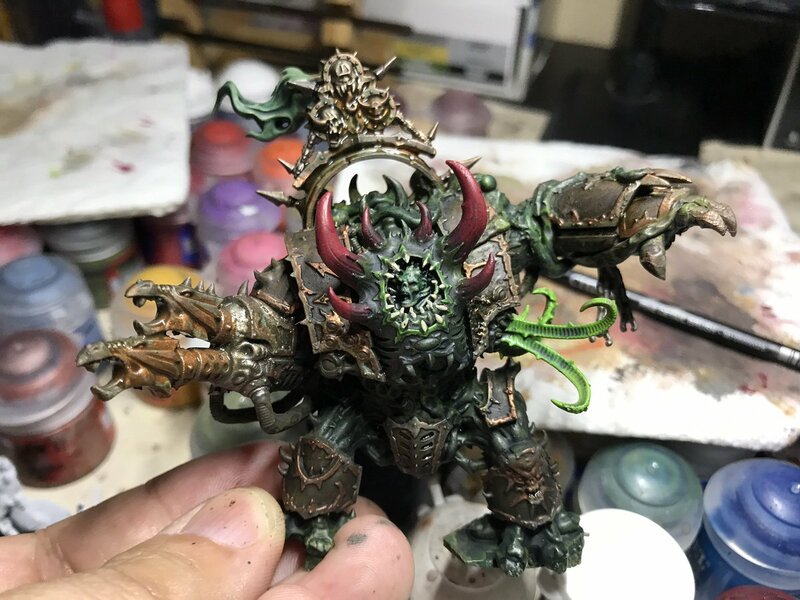 Then I undercoat him in the new Death Guard spray, do several washes of sepia and Agrax, and then covered fairly aggressively in Typhus corruption. 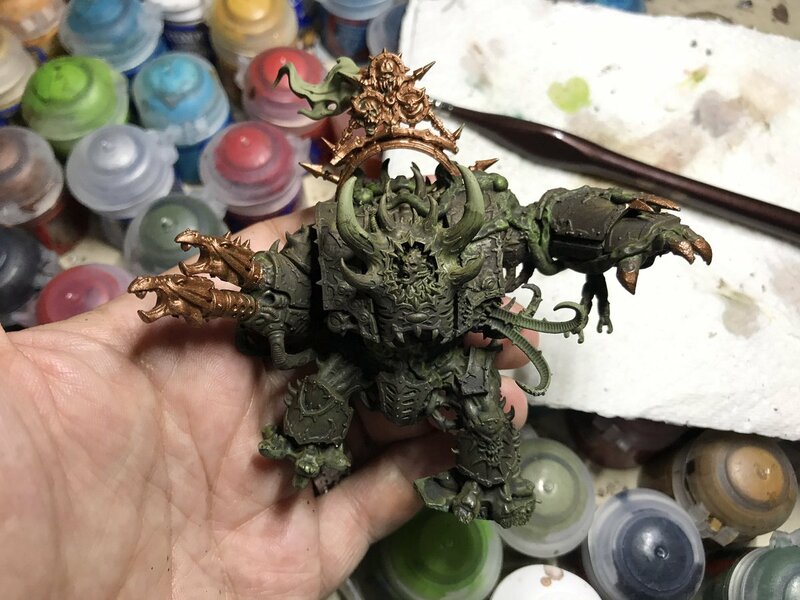 This is all to try to achieve an 'old and worn' look that fits the Nurgle theme. I chose a worn bronze look for the trim and metal components and then continue with multiple washes to create the worn texture look. Then I pick out the flesh parts with a darker green. I choose red as a relief and contrasting break-up color for his horns. Then I start picking out the details as I move into the final stretch. I highlight up the flesh parts with Moot green, before subduing it again with a few camoshade washes. There is definitely a stage in here where I always feel the model looks terrible, whether it is one too many washes, the wrong color, or the wrong order of washes, but it got there in the end. 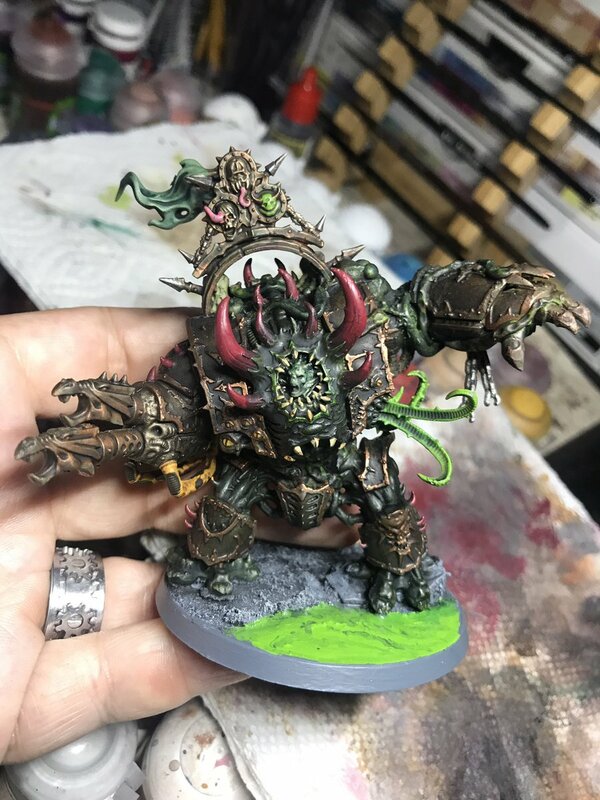 The finished result looks suitably Nurgle! 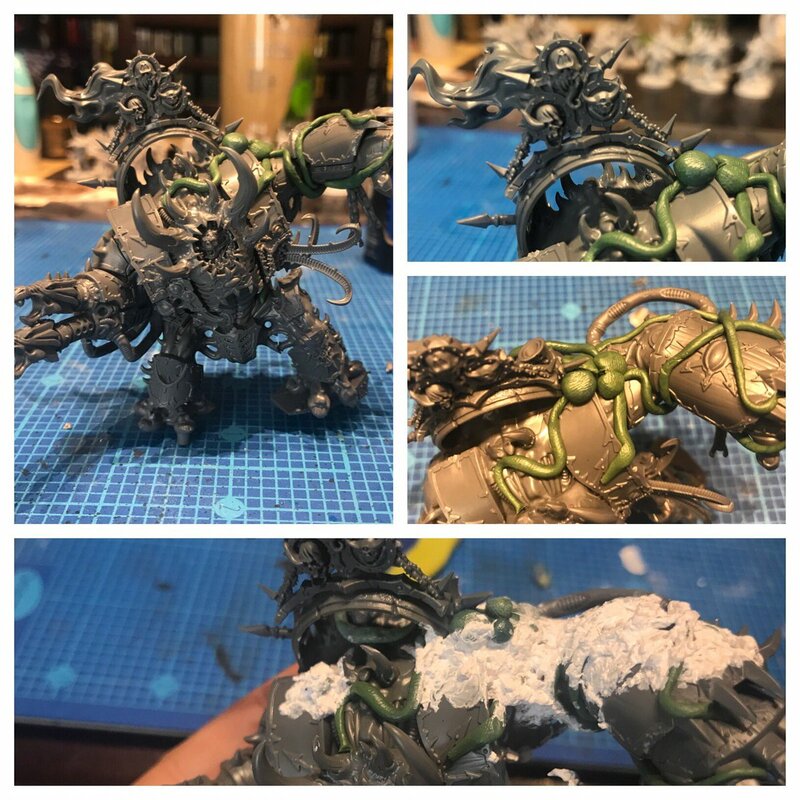 I'm contemplating doing a Chaos Knight in this technique as well, will be interesting to see if the approach can scale up to the larger kit! 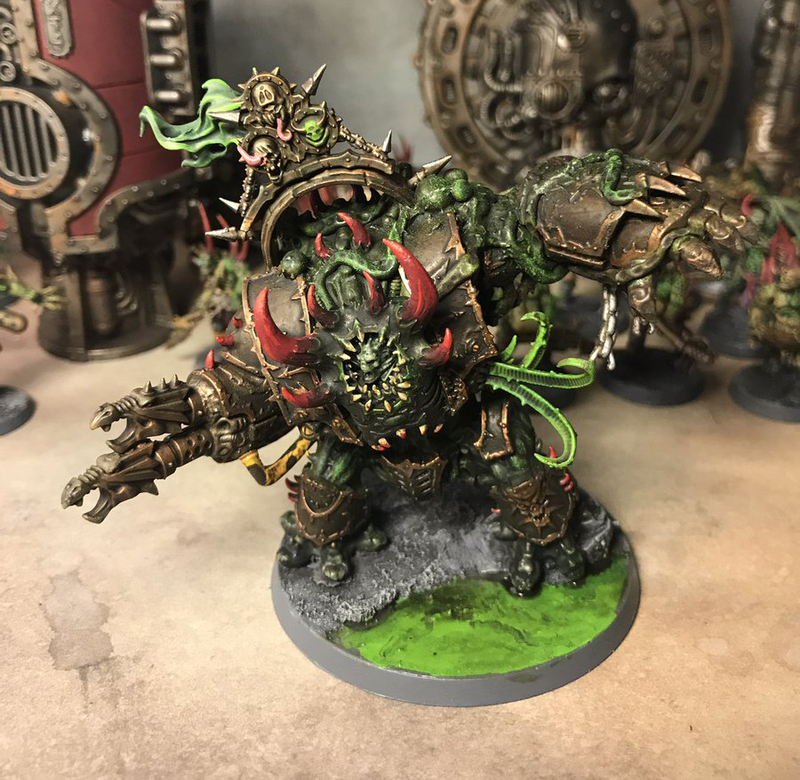 First though, I think the Blightwar box may be calling me!